go usa. you did it. happy days. 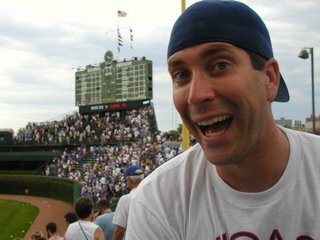 i'm also happy because i finally went to a cubs/sox game where the cubs came out on top. you can't see it, but in the background the scoreboard says white sox 11, cubs 15. don't worry, no long winded play in 3 acts about this one. let's face it: their season is over. and it's a lot easier not to care too much one way or another. other cubs fans can understand. my 3rd wedding in 7 days. that's not a misprint. sat, mon, and now sat again. new pirates of the carribean movie. yeah, that's right. i'm into them. a bachelor party golf outing. more golf is always good. my sprint triathlon. we'll see how in shape i am for this one. at least it's short. sleeping in. good gravy i love sleep. poker. online and otherwise. i may not be as addicted as marc, but it's close.